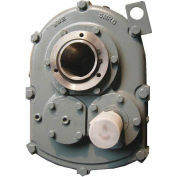 The "Ultimate" Shaft Mount Reducer, Box size 7, 15:1 ratio, 3-15/16" Output bore (max. 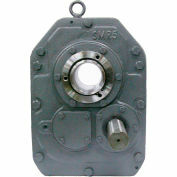 ), Tapered bushing type (Tapered bushing not included); Torque arm included; 3 year warranty; dimensional drop-in for a Dodge TXT series; shafts and gears manufactured from high grade steel, case hardened and precision ground to A.G.M.A. standards; metal reinforced double lip, spring loaded oil seals.